An increasingly popular sentiment, most recently articulated by Sinclair Davidson and Chris Berg in their new book Against Public Broadcasting, holds that we would all be better off were the ABC to be sold, closed, handed to its employees or by some other means shunted from the taxpayers’ trough. Such a move couldn’t do any harm, certainly, but leaving the field to commercial operators is no guarantee of improvement. The proof comes from New Zealand, where the public broadcaster has been largely dismantled but the orthodoxy of political correctness, along with the interruptions needed to save from it from scrutiny and criticism, continues to thrive. 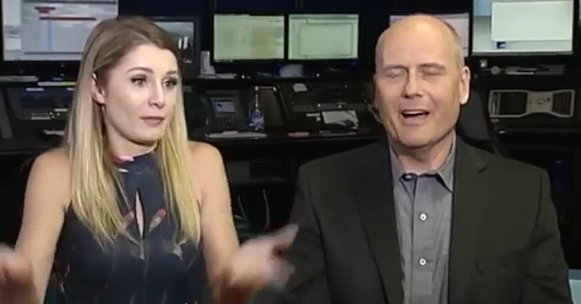 Follow this link or the one below for 10 minutes of two articulate people, Lauren Southern and Stefan Molyneux, being quizzed by a commercial station’s resident simpleton, an interrogator so “woke” and so determined to quash answers he doesn’t like that it’s a wonder he hasn’t been recruited by the ABC. Yes, he’s not only that bad, he’s even worse. The interview, by the way, was prompted by the speakers’ announced venue cancelling their appearance at the last moment, of which tour promoter Dave Pellowe has written at left. He is understandably concerned that free speech was once again suppressed by harassment and threats of leftist violence. That doesn’t bother the dullard interviewer, a purported journalist, in the least.